A day off, the to do list, and the spa weekend away! - Time for a nice cup of tea? A day off, the to do list, and the spa weekend away! I have the day off today and am getting ready to go away for the weekend ALL BY MYSELF! To this lovely hotel for some spa time, yoga, reading, laptop time, and generally decompressing. 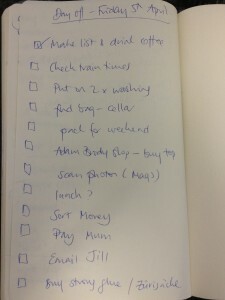 Just have to get a few things checked off my to do list first! I am just very excited at going away all alone. My inner introvert can't wait. Hotel room to myself. Big bed. No complicated bedtime routine. No cooking. Just looking after myself. I should feel some Mummy guilt, but I really don't! March has been a horrible month of everyone being sick, me having my wisdom teeth out, lots going on at work, and everyone being sick again. Hence the lack of blogging. However, hold onto your hats, since I will be catching up on my writing & photos this weekend - you have been warned! Lenzerheide is such a great place and 'Hotel Schweizerhof' absolutely awesome. You'll love it.